The word Salzburg means "salt castle" and refers to the importance that the "white gold" had for the development of this city. Many visitors who come to Salzburg want to spend time not only in the city itself, but also in the surroundings - and going on a salt mine tour is among the best day-trips one can do. There are several salt mines available. 1.) Hallein and Dürrnberg Salt Mines: The first and by far most popular destination for a quick Salzburg salt mine tour that came into our mind was Hallein. The pretty town just south of Salzburg can be accessed by public means of transport (trains and busses) and is home to "the" salt mines of Salzburg. Today, salt is not being mined here anymore, but this is actually an advantage: This way, you can enjoy the place as show mine, alongside with multi-media shows, a museum of Celtic culture and information on salt trade. Note also the pretty town centre of Hallein. 2.) Hallstatt: A bit further away from Salzburg, but extremely rewarding. Hallstatt is a UNESCO World Cultural Heritage Site. 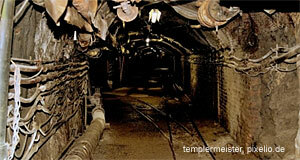 This would go beyond a simple salt mine tour, since Hallstatt lies in the centre of the picturesque Salzkammergut. There is also a pretty town, a lake, hills and the show mines to see. Note that if you want to do Hallstatt by public transport, you should plan in advance as this will take time. Alternatively, you can rent a car or book a package tour. 3.) Bad Reichenhall: Over the border to Germany, you will soon get to Bad Reichenhall. It can be considered to be a destination for a salt mine tour since it was long dependent on mining and trade with the white gold. However, most visitors now come to Bad Reichenhall because of the local spa. International tourists like it for the vicinity to the Obersalzberg with the Eagle′s Nest (Kehlsteinhaus) and the Lake Königssee. Note that if you are interested in the salty heritage of Salzburg, you might want to spend some time in the Salzburg Museum. For a proper Salt Mine Tour, you might also want to go to Oberndorf or one of the market towns along the river Inn - most of these places grew rich on salt trade in the Baroque age, since the Salzach River and the Inn were important trade and traffic routes.